When one has chickens, one is given chicken things. Many chicken things. I find homes for the smaller chickens by tucking them in corners, in rafters, and on tiny shelves. 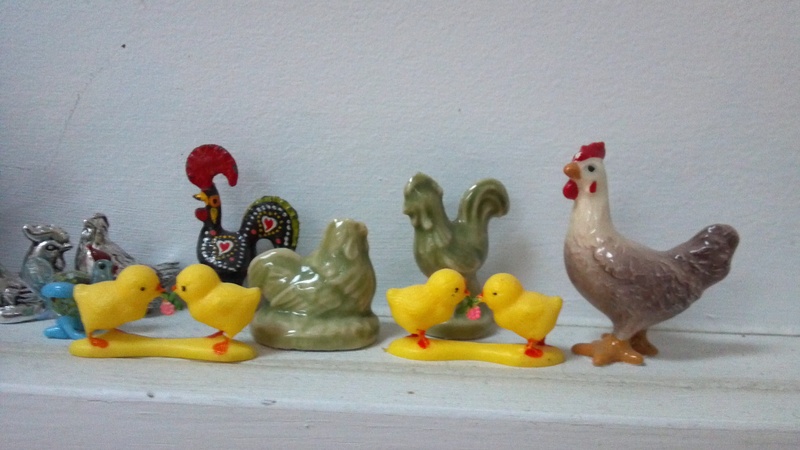 Maintaining my figurine chicken flock is sometimes as challenging as maintaining the real one. Where will I put this little beauty in order to show her off and yet keep her from harm? One of the things, however, that I have no difficulty collecting and which, thankfully, doesn’t take up a lot of space, are my chicken pins. I simply wouldn’t think of holding a chicken workshop without wearing one. 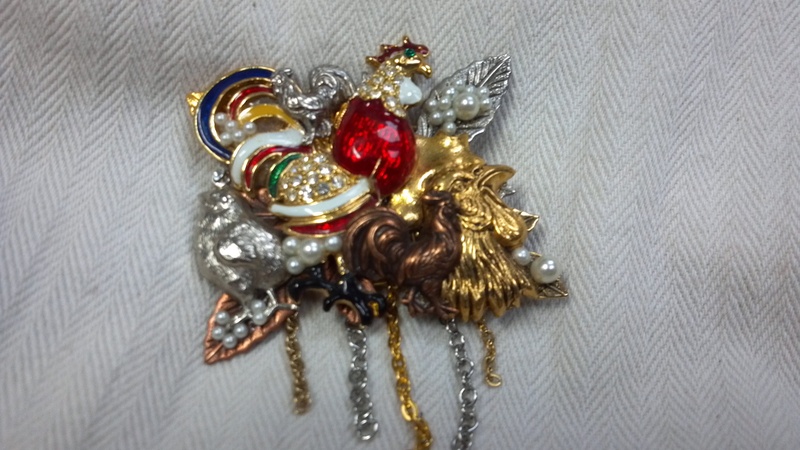 I wore this handsome rooster to the chicken workshop I held last night for a Gardening Club. 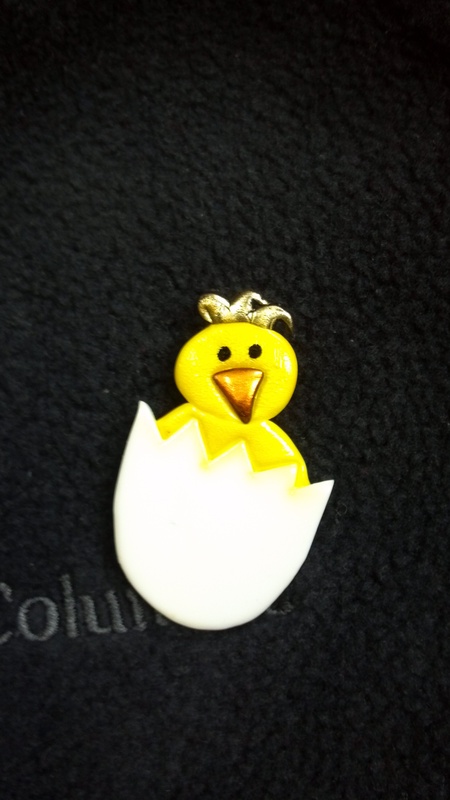 And this is the pin that my kids particularly like – they see it as a puzzle (kind of like find the triangles) and try to count the number of chickens. I can’t go anywhere without people remarking on this striking little guy. 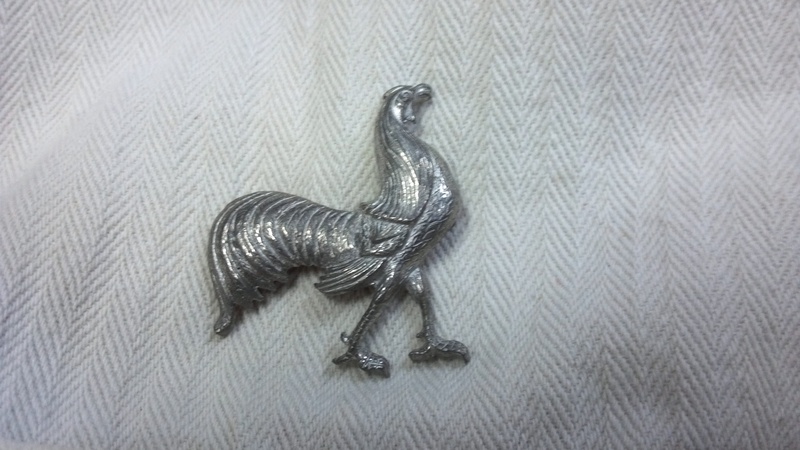 While the day may come when I might have to hold up a hand in protest before being gifted with yet another chicken figurine (after all, I’m not really looking for the Crazy Chicken Lady award) don’t expect me to ever say no to another chicken pin. It’s too much like having the support of my entire flock on my shoulder where ever I go. I very much enjoyed you presentation last night – very informative. Who knew chicken could be so much fun! You get in touch with me if you have any questions.